For some reason, I decided that burgers sounded good for dinner tonight. Not ones with beef...or turkey...ones with beans, nuts and cheese! I love a good non-meat burger. These are not tveggie burgers however, since they are mostly made of proteins, but they sure were satisfying! The burgers I came up with were a clean out the fridge composition of ingredients. I had some leftover white beans, some roquefort, and some toasted walnuts, so I thought they would be good as the base of my burger. I also threw in some flour and eggs for a binder, as well as some garlic and basil for flavor...no breadcrumbs surprisingly, since I don't have any bread on hand at the moment. I had a few cherry tomatoes and basil so I thought I would roast the tomatoes and top them with basil as a nice compliment beside the burgers. The burgers baked up wonderfully, and were super easy to make. I don't think I will ever miss meat burgers...especially with ones like these instead! Preheat oven to 450 degrees. Line 2 baking sheets with foil and spray with non-stick spray. Toss cherry tomatoes with 1 Tbsp olive oil, and spread out on one of the sheets. Roast for about 15 minutes, or until tomatoes have burst and are soft. Remove from oven, place in a bowl, and sprinkle with sea salt, and freshly ground pepper as well as 1 Tbsp balsamic vineger. Meanwhile, puree 1/2 cup beans in food processor. Add bean puree to bowl along with remaining beans, walnuts, roquefort, flour, garlic, egg, basil, sea salt, and pepper, and mix until well blended. Make the mixture into 4 patties, and place on other prepared baking sheet. Bake for 20 minutes until lightly brown. Meanwhile, mix vegannaise with dijon and set aside. 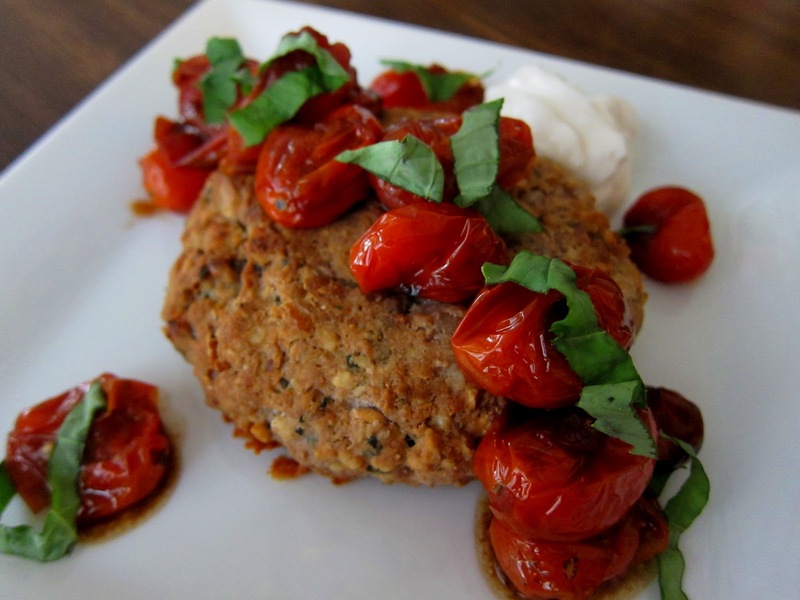 To serve place burger on a plate, and spoon some tomatoes over the top, with a little basil on top. Spoon a dallop of the dijon mayo on the side, and serve! The 'burgers' look SUPER good, I love all the ingredients! Those look delicious! I love the addition of the roquefort. I'll bet that really added to the flavor. Mmmm! I'm vegetarian so I'm always on the lookout for great veggie burger recipes and this sounds so good and satisfying! Thanks for sharing.